This page is for the Sounds, Letters, and Words version of Focus on First. You can find the Fundations-aligned version of FoF here. Please note - for full access to these resources you need to have first logged into your BPS email account. 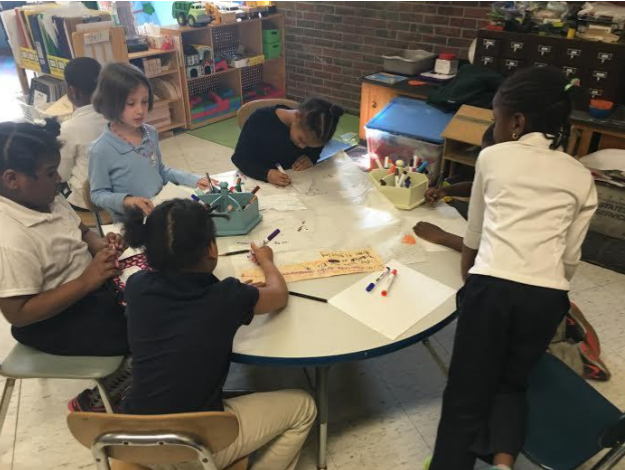 Boston Public School’s Focus on First curriculum is an integrated, content-based approach to literacy. To reflect today’s world and children’s 21st century experiences, the overarching theme of the curriculum is globalization. Over the course of the year, from many angles, children and educators study today’s global and changing world, learning essential first grade literacy skills along the way. Children dig deeply into content knowledge and express their developing understandings through diverse means. They integrate, deepen, and expand their understandings of what it means to be a global citizen and a citizen of Boston. For pacing calendar and Assessments, see the Fundations-aligned version of Focus on First. The Launch unit in Focus on First sets children and teachers up for a successful programmatic learning experience. The design of this 2-week period includes built-in time to help children learn about classroom and literacy routines, but is grounded in thematic content that focuses on the shared experiences of children around the world – beginning with going to school and learning. In this unit, children learn about relational connections, within and across communities, including families, classrooms, and neighborhoods—and the influence of these connections on both the individual and the group. In this unit, children learn about the ways that people around the world get what they need, and how the exchange of goods and services affects people’s lives and promotes the interconnectedness of our global community. Building upon Unit 2 of Focus on K2, children will learn about how animals are different from one another and what makes them different. Children will also learn about how animals are the same in certain ways. During this unit, children will have the opportunity to think and talk about how animal differences can help them survive in their habitats as well as ways that communities and scientists can partner together to protect animal habitats. In this unit, children learn to understand how weather affects people and communities across the world. Students have a chance to read and learn scientific weather information, to think about the kinds of weather we experience in Boston, and also hear stories that highlight cultural explanations for weather-related occurrences. The culminating project allows students an opportunity to generate a narrative around personal experiences with weather. In this unit, children think about how new ideas and products have changed lives, and learn about some of the inventors who have been behind the world’s advancements. Inspired by fiction, non-fiction and poetry, students have the opportunity to reflect on life today versus life long ago, and think through the kinds of inventions that made daily life for their parents and grandparents very different than it is for them. Among other conversations, we challenge the children to discuss how discoveries often occur because people are observing carefully and thinking about ways to improve daily life, and we also challenge them to discuss whether new inventions improve life, or whether old ways of doing things have benefits, too. Why do we need maps? We use particular maps according to the information we want to gain. In Unit 6 children begin to learn what maps are and how to read and use them. The representation of a large space on a small piece of paper is an abstraction; children will develop this concept over time. Children will look at and analyze different types of maps to learn that maps provide us with different types of information. By creating their individual “Me on the Map” booklets, children will share the location of their school, important places in their communities, and special places in the world.